Thank you to Olivia Slack for entertaining us with her stories of growing up on the farm . Olivia is 19 years old, unfortunately her mum Judith passed away after fighting her personal battle with cancer in December of 1998. Her mum was Peter’s sister, so having two children of their own Peter and Sylvia Slack took Olivia in aged 2 years old and brought her up as their own. As a consequence, and quite rightly, they call her their daughter and Olivia calls them mum and dad. We’re delighted to announce that on the 11th February we held our 19th Annual Ball and raised a whopping £19,500 through the generosity of our sponsors and guests. The event was sold out which made for a great atmosphere for our ‘Bring on the Stars’ themed evening. Entertainment was provided by young singer Ellie Ferguson,( just 12 years of age) and Skipton band ‘Undercover’, followed by KK’s legendary disco enabling Petal partygoers to’ strut their stuff’ until the early hours. Reverend Priestly Brook, honorary member of Petal delivered the ‘pre-dinner grace’ in his customary personalised and humorous style that we and our guests have come to love. Sincere thanks to all our valued sponsors and of course all who attended and we do hope to see you all at next year’s event ! Date soon to be announced. Sincere thanks to all 3 speakers and as always to all our fabulous supporters who attended today and helped us to raise £2604 whilst having a great afternoon out. Official photographs from our 2017 ‘Bring on the Stars’ fundraising Ball are still to come but in the meantime we are over the moon to let all our supporters know that we raised a magnificent £19,500 on the night. This was thanks in the main to the generosity of all the fantastic auction prizes that were donated as well as the fact that the event was completely sold out. Young up and coming vocalist Ellie Ferguson kicked off the entertainment programme with her stunning rendition of ‘Lean on Me’ and another set of ‘get up and dance’ numbers later in the evening. Skipton Band ‘Undercover’ then performed until late followed by KK’s Legendary Disco until VERY late! (Many sore feet were reported the morning after!!). Many thanks to all our sponsors and supporters for making it a night to remember. My journey started one ordinary Christmas that would drastically and suddenly take over and transform the lives of me and my family. I had an unpleasant chest infection and after numerous antibiotics failed to overcome it, my Mum realised that there was something more. Especially as it wasn’t long before I developed more unusual symptoms; including bruises and widespread body aches. I would sit quietly for hours and have no spirit to play with any toys or take a trip to the park. This clearly was abnormal for a previously active 3 years old child. My grandmother became troubled as she had sadly already seen her mother and my great grandmother dying at the hands of Leukaemia. My mother no longer settled for minor solutions and took me to the doctor to explain her major concerns, to which they took multiple blood tests. In a matter of hours, she received a phone call urgently notifying us that I had to be admitted to hospital immediately. I was taken to Royal Blackburn Hospital and later transferred to Pendlebury Children’s Hospital in Manchester. My family followed distressed and confused. I was only a young child with little understanding of the severity of events – this was the first clear example that my journey did not just affect me, but had an indescribable impact on the wellbeing of my family. On the 20th of February, my family received the devastating news that I had Acute Lymphoblastic Leukaemia. This was the moment my life changed for the unforeseeable future. I was taken to a cancer ward which from then on became my home for three years, throughout; birthdays, special events, friend’s parties, Christmas, and even the start of my primary school yearsThe first morning I undertook lumbar punctures, bone marrow examinations and tests to find out the extent of the cancer. The consultants then advised my Mum and Dad that they now had to make a decision. They were asked to make one of the hardest decisions any parent could be faced with; one that would determine my treatment and could be the difference between life and death of their child. The doctors stated that they couldn’t identify which treatment would be best and advised it would be wise to let an automatic system judge. The verdict was between having two major chemotherapy treatments or three. They were told that two may not have been enough or three could have been too much. My mother prayed for three, and the computer chose three. The next day I was hooked up to machines with drips for blood and platelet transfusion, and started receiving high doses of steroids. I was frightened; I wouldn’t speak and would tell everyone to “go away”. This was the only time I got away with being bad-tempered but I can’t use the same excuse any longer – no matter how much I try! It was fitting that my family nicknamed the steroids ‘grumpy pills’. But one of the worst experiences for me was countless painful injections. I sat with my Mum until it was all over; tears running down both of our faces. 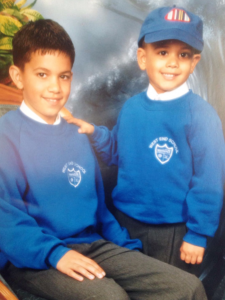 I was also taken to theatre to be fitted with a Hickman line – though this didn’t stop me and my brother from play fighting. My mother would always say “I wish it was me”. After the initial shock, I made friends with other children in the hospital. Sadly, the vast majority of my new friends didn’t survive their illness. This reality makes me realise everyday how lucky I am to be here today. I turned four in May the same year, and started school at West End Primary School in September. I attended when able, accompanied by my trendy blue cap to cover my hair loss. If it wasn’t for the support given to me and my family by the school, notably my teacher Mrs Carol Cope, I don’t think I could have got through the first year and been able to make the most out of my education to date. I was in and out of hospital a lot due to the nature of the treatment. I received chemotherapy for a week and allowed to go home for a few days only to be re-admitted with an infection. A current unavoidable side effect to chemotherapy is developing further complications. To name a few, I suffered from Rota Virus, pneumonia and was paralysed with an injection that was too potent. The effects of severe illness can be felt by everyone, and I am tremendously blessed to have had my remarkable family around me throughout the whole journey. My mother never left my side; she would sleep all night in the chair beside my bed and would only go for a drink when someone else came. I couldn’t have asked for a more caring brother, who lost the attention of his parents and family for many years but never complained and just wanted to see me recover. My father and grandparents came every night after work, and my whole family rallied to support me and each other. At such an appalling time, this was essential. I was also supported by a number of charities, especially when I was taken on trips to Disneyland America with the Kensington Dream Foundation, and Lapland and Disneyland Paris with Wish Upon a Star. 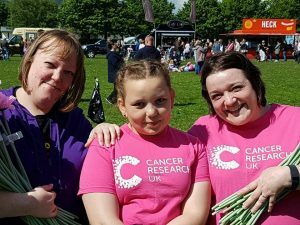 This highlights the vital work charities are doing to battle cancer and reduce the effect it has on the patient and their families. After years of treatment, I was fortunate to react positively and enter remission. I would attend for check-ups every week which then spaced out as time went on without a sign of relapse. I now only attend when I am asked, more than happy to help with research for children undergoing the same treatment. I am truly indebted and extremely grateful to all those who selflessly supported me no matter how big or small; including my family, our friends, those who give their time to raise money, and without doubt the phenomenal doctors, nurses and staff at Pendlebury Children’s Hospital that have saved and continue to save the lives of many children every day. Without them, I wouldn’t be here to describe experience of battling cancer. I will now do everything I can to use my experiences to assist and give hope to those that are going through a similar life-changing journey. 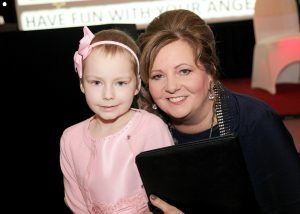 For that reason, there is no better motivation to support the outstanding work being done by Petal Cancer Research. Hope to see you all at Petal’s 24 hour Relay for Life community event on 3rd and 4th September at Paythorne commencing 12.00 midday on Saturday 3rd September! We are delighted to announce that Greig Trout will be guest speaker at our Petal luncheon on 20th July at The Rendezvous Hotel, Skipton. Greig is a two time cancer survivor and the founder of 101 Things To Do When You Survive, a website and initiative designed to spread hope and inspire those living with cancer. Greig was first diagnosed as a 7 year old and again at age 30. After surviving cancer for the second time, hefound that the psychological effects that came with cancer and survivorship were his toughest fight yet and something he was in no way expecting to experience. In order to help him start enjoying life again he decided to follow a life-long dream and travel the world. 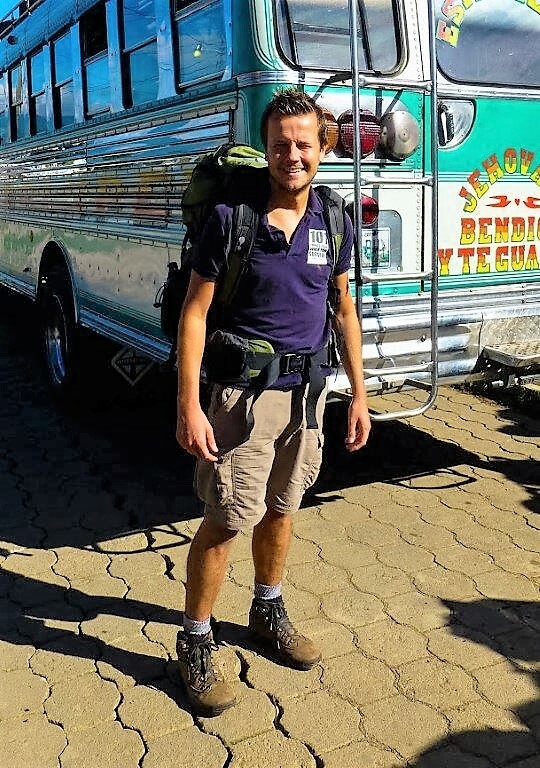 With one kidney, half a bowel, deep vein thrombosis and the lingering effects of PTSD, he set off on a journey that would not only help himself but help many others in the process.101 Things to Do When You Survive was developed as a way of helping those struggling with ill health to feel excited about the future instead of fearing it. 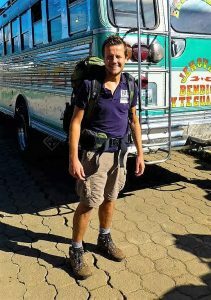 For two years Greig travelled through 23 countries, volunteering, raising money and awareness for various organisations and ticking things off his anti- bucket list, from volcano boarding to singing on stage at the Sydney Opera House. Greig is now an inspirational speaker as well as the Director of Kindness for the charity 52 Lives. 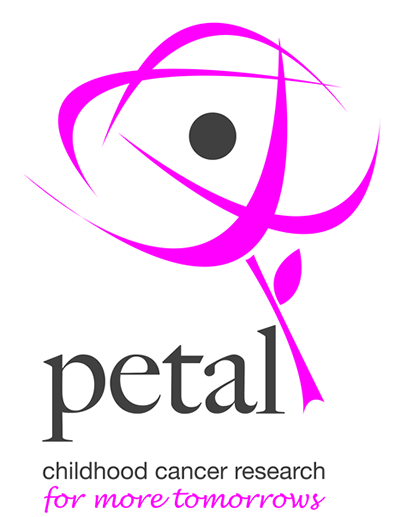 All at Petal are absolutely over the moon that Karen Weaving, our founder and secretary, has at last received substantial recognition for her many years of commitment and constant efforts in fundraising for research into childhood cancers. This recognition comes in the prestigious form of an Honorary Fellowship of Cancer Research UK. 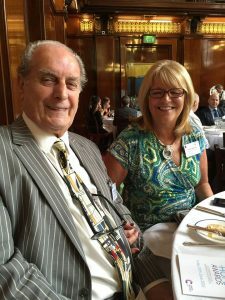 Karen and Malcolm, (husband, honorary Petal Member and fellow fundraiser), travelled to CRUK’s awards luncheon at Merchant Taylor’s Hall in London last month to receive the award. Bravo ‘our Karen’- we wholeheartedly salute you and couldn’t be happier at this acknowledgment of your tireless dedication in working ‘for more tomorrows for children with cancer’. Three enormous cheers for Karen Weaving!!! Action Man Extraordinaire Ed Lee has now passed the halfway point of his challenge to run/walk 2,600kms in 2016 in order to raise money for Petal and Pendleside Hospice. Ed is well on the way to achieving his target as we now approach the half way point in the year. Monty’s Pedigree Chums have done it again! 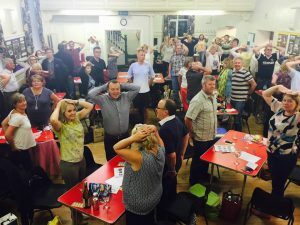 On 24th June Monty’s Pedigree Chums relay team held their ever popular quiz and social night at Foulridge Village Hall. Delighted to report that it was a sold out event and they raised a fantastic £700 for Petal. Committee member Angela Stuttard and partner Bruce Corden organised the event supported by committee member Liz Mitchell and Janet Leafe from Cancer Research UK. Turners of Barrowford very generously donated the first prize. Very well done and big thanks to all who supported the evening by attending or donating their time and raffle prizes. Feisty flower girls Gill, Kelly and Aimee from the Euravia Relay Team raised a fabulous £127 last Sunday selling silk flowers at the Cancer Research UK Race For Life in Ilkley. 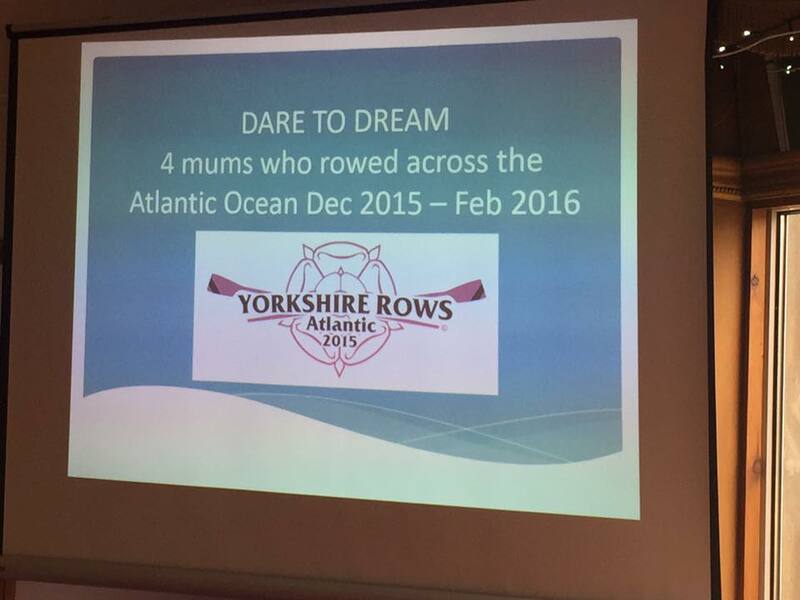 Very well done girls – your team is well and truly on track to your target. If anyone else would like some flowers to sell to raise funds for your Petal Relay for Life team then please do let us know!